Not too shabby, is it? Which is why it is now worth saving your old goopy nail-polish the next time you find some extra lying about or are looking to purge your supply! Keep reading to see how that gooey mess can become a pretty piece of jewelry. . . or maybe even something more . 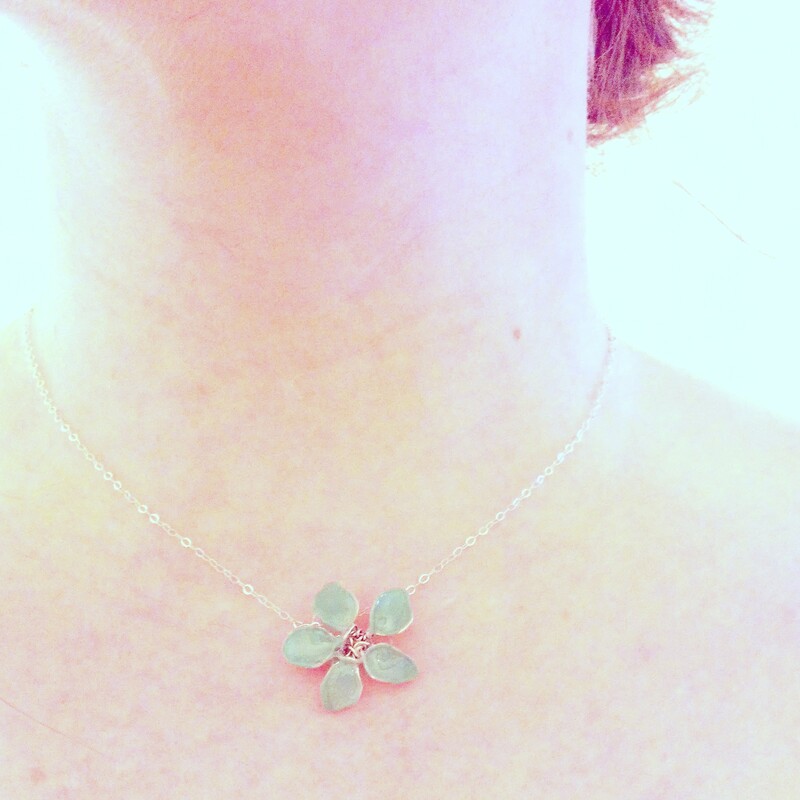 . .
*If you want to make it/them into a necklace, you will also need a chain and some links to close it – they’re easy to find on Etsy! Starting with just wire, cut yourself about a six-inch piece. 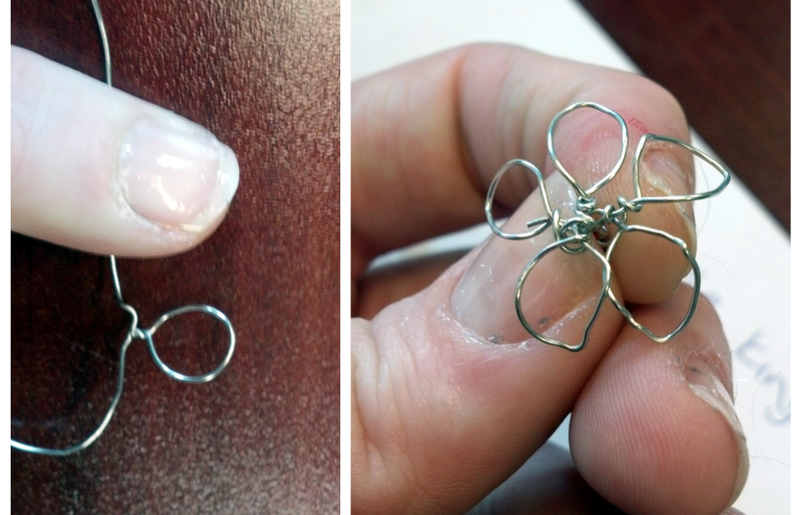 Then use pen as the petal-measure, wrapping the wire around once and twisting it to secure the round shape. You repeat this process 5 times, or until you are satisfied, then bend your petals around to give them a less circular shape . I personally did this one by hand, but I’ve since done some better ones using needle-nosed pliers! Once you have the flower framework of wire, all you need to do is drip goopy nail-polish over the petals and then allow them to dry. This makes a delicate-looking tissue for the petals! Since I only had old clear nail-polish, I decided to paint over that with some of my less-congealed colors, and I was pleasantly pleased with the effect! Now all that remains is to turn it into something usable or wearable! Since your flower still has a “stem” of metal, it makes sense to use that to create loops in order to hang the flowers from a necklace or chain. Other ideas I’ve toyed with include flower-girl headdresses (lots of these in pearly white would look lovely as a wreath, which could be put together using florists tape! ), summery-topped bobby-pins, and daisy-chain bracelets. 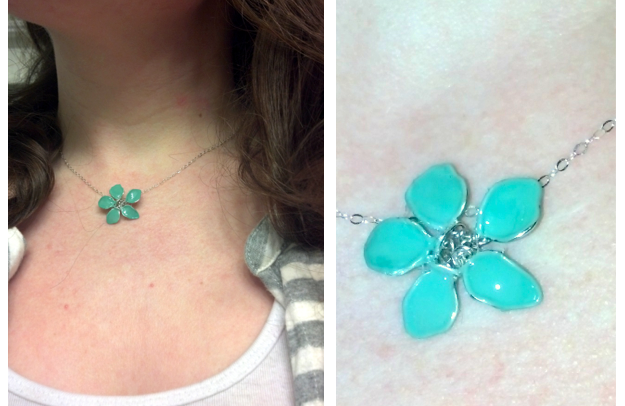 Now, I am still a nail-polish jewelry novice, but I have some pretty exciting ideas for these little flowers! « Walking For A Cause . . .